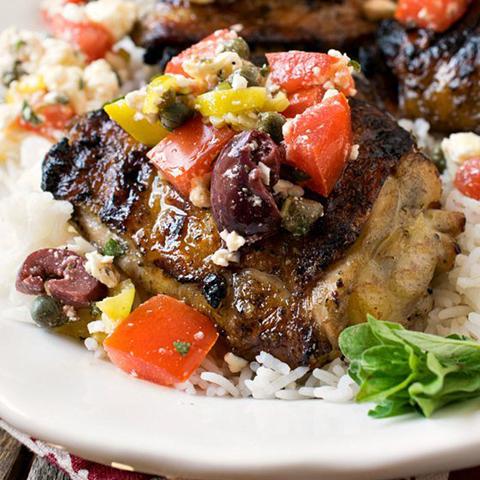 Bursting with briney deliciousness from the Capers, Kalamata Olives, and Feta Cheese, this bold summer chicken dish pairs perfectly with our 2014 Prelude GSM Blend. Best served outside surrounded by friends! – Using a food processor, finely chop Shallots, add Garlic, Lemon zest and juice, and Olives, Pepperoncini, Capers, Parsley, Oregano, Peppercorns, Salt, and liquid reserved from jars. Process to form a thick paste then slowly add Olive Oil with the processor running. Add Water and mix to combine. The mixture should be a thick paste. – Place Chicken pieces in one or more gallon zip-lock bags and pour in brine paste. Seal and refrigerate for at least six hours or overnight. – Remove from bags and rinse Chicken. Discard Brine paste. Line a tray with paper towels and place rinsed Chicken onto the towels. Use more paper towels to dry the top of the Chicken. Let sit at room temperature for 30 minutes. – While the Chicken is resting, make White Rice according to package instructions and preheat your outdoor grill to high. – Mix all of the topping ingredients in a small bowl and refrigerate until later. – When the grill is ready, brush both sides of the Chicken in Olive Oil and sprinkle skin side with Salt and Pepper. – Grill skin side down for two minutes to crisp the skin. – After two minutes, reduce grill to low heat and move the Chicken to a cooler part of the grill or an upper rack if possible. Place skin side up, cover, and grill for 15 more minutes until cooked through. Try to keep the grill in the 350° to 400° range. – Remove from the grill, top with the topping, and serve over White Rice.